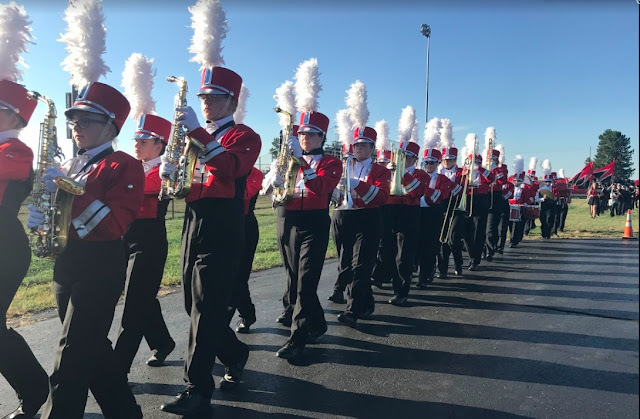 14 members of the FHSCB will be traveling with choir and art students to Cedarville University on Thursday, February 25 to rehearse and perform with the OHC honor band. Students will work with a guest conductor during the day then perform a concert at 7pm that evening. Dinner is provided at the university dining hall. You must either pack a lunch or bring $7 for the dining hall for the mid-day meal. Having some snacks on hand might help you get through the day as well. Make sure you have your music as well as any and all instruments and supplies. Concert dress is our regular concert attire. You will have time and a place to change. Dress during the day is school casual. The concert is open to the public. Parents, family, and friends are welcome! Do your best to prepare your music in advance. There will be many full and sectional rehearsals at the event, but at least have played through your music and marked accidentals, keys, meter changes, etc. You are responsible for any missed work for the day. Please arrange with your teachers in advance to make up your assignments. You are expected to represent Fairbanks well and be on your best behavior. This is our first time at this event so do your best, be flexible, and enjoy the experience!